Junior wide out Owen Peters caught the nail in the coffin touchdown pass with just over four minutes remaining in the tilt. The touchdown earned Cornell it's first lead of the afternoon, one they held on to for the remainder of the contest. ITHACA, N.Y. — One year ago this week, Harvard football traveled to Ithaca, N.Y., to challenge the Cornell Big Red. The Crimson had not dropped a game to this fellow Ivy League team since 2005. With a 2-1 record — 1-0 in league play — Harvard took a 14-0 lead before allowing 17 unanswered points. Cornell, at the time 1-2 with an in-conference loss, had pulled off the upset and pulled even with the Crimson. This year, the story remained the same. 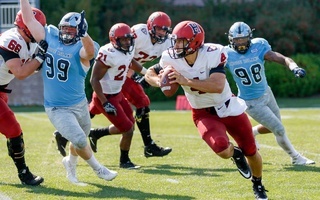 At one point trailing 24-14, the Big Red stormed back to notch 14 unanswered points and steal what seemed to be a likely road victory for Harvard (2-2, 1-1 Ivy) at Schoellkopf Field. Entering the final frame, the Crimson commanded a 17-14 advantage. 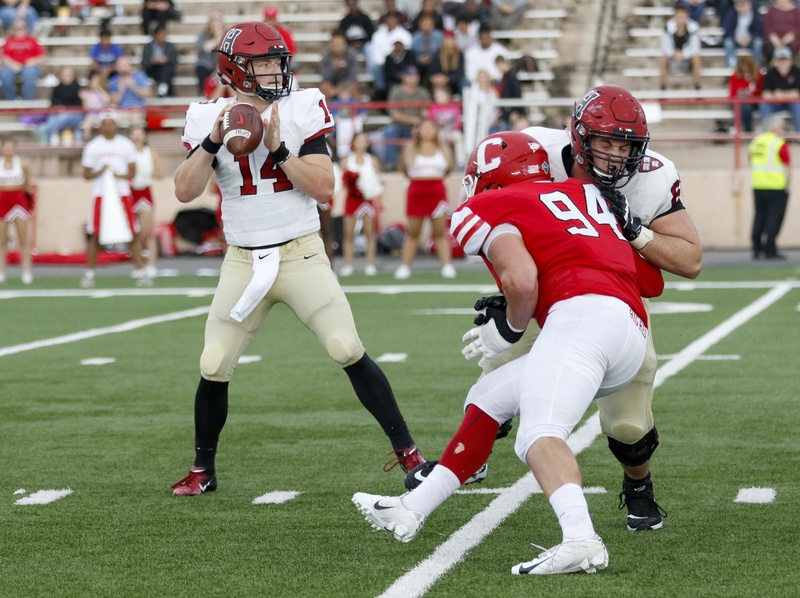 The two sides traded touchdowns early in the fourth quarter, Harvard’s on a 29-yard pass to Henry Taylor and Cornell’s on a 34-yard run by Harold Coles. A Crimson three-and-out later, the Big Red found the ball in its hands just as the noise in the stadium swelled to a higher volume than it had all game. The newfound energy invigorated the Cornell attack. 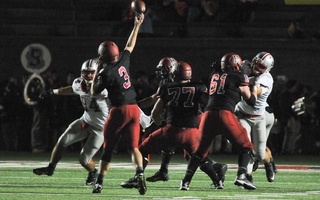 From the Harvard 33, quarterback Dalton Banks dropped back and had all day to throw the ball. He spotted receiver Owen Peters bolting downfield and obliged by airing it out in his direction. The play worked perfectly — Peters snagged the pass near the end zone with his defender a step behind, and he skipped out the back of the scoring region as his team chased him down. The Big Red grabbed its first lead of the game, 28-24. Over four minutes remained on the clock, but the Crimson could not answer. Its first chance stalled at its own 28, and another effort fell short on a desperation fourth-and-nine incompletion. Sophomore running back Aaron Shampklin is responsible for 105 of Harvard's 161 yards in the first half. The final score betrayed the fact that the teams slogged through a first half that ended 7-7, replete with ineffective offense and punts galore. Both teams failed to pass the ball effectively, and the Crimson focused almost exclusively on the run. Notably, running back Aaron Shampklin submitted another outstanding performance out of the backfield. The sophomore took 27 handoffs, gained 191 yards, and tallied a touchdown on the game’s first drive, his fifth score of the season. However, in the third quarter the offenses came alive and changed the entire character of the game. Harvard stormed out of the locker room for the second half looking like it had rediscovered whatever was working at the very outset of the game. Cornell received to open the quarter, but the Crimson defense quickly shut down the Big Red on a three-and-out. That’s when quarterback Tom Stewart and his cadre of offensive weapons punched into work. The senior backup managed to gain 23 rushing yards on a misdirection to advance Harvard to Cornell’s 29. Two plays later, Stewart reared back and lofted the ball toward the end zone. It appeared to be sailing long, but Adam Scott reached out and hauled in the pass just before vacating the field. Crimson 14, Big Red 7. Senior quarterback Tom Stewart spelled sophomore quarterback Jake Smith towards the end of the second quarter. The senior threw for two touchdowns on the afternoon. Stewart entered the game near the conclusion of the first half, spelling sophomore starter Jake Smith. At that point, Smith was 3-of-11 on his passing attempts and had suffered two sacks. Neither quarterback got into a groove, as Stewart finished 7-of-23 for 100 yards, though he did complete two challenging touchdown passes. Cornell’s quarterback duo was determined to answer Scott’s touchdown quickly, and answer it did. Banks began the drive by tossing a pass to Peters, who was dragged down at the 30 before he could escape to the end zone. Two plays later, junior Mike Catanese —functioning more as a running back than a passer — broke free, weaving through Harvard defenders for a 32-yard score. All of a sudden, the game was tied once more. Just over five minutes into the third quarter, the teams had doubled their respective first-half outputs. Junior quarterback Mike Cantanese led the home team in rushing yards, opting not to throw a pass all game. Big Red coach David Archer’s usage of Banks and Catanese was unique. Catanese did not throw a pass all day, instead taking direct snaps and rushing for 75 yards. Banks managed the passing game, finishing the day with 201 yards at an 18-for-24 clip. After Catanese’s score, the Crimson wasted 5:05 of clock time to put three more points on the board and break the deadlock, as junior kicker Jake McIntyre hit a career-long 42-yard field goal. Harvard would look to calm Cornell’s offense as the clock wound down to 4:09 remaining in the third quarter. Big Red returner David Jones received the ensuing kickoff with his feet in his own end zone and decided to take a chance on a return. That chance appeared to pay off, as Jones blasted 100 yards past the Crimson kickoff unit for a score. However, teammate Harold Coles was flagged for holding on the return, and the play was dragged all the way back to Cornell’s own 18. Instead of a game-changing touchdown, the Big Red had to settle for its seventh punt. That called-back return touchdown seemed to be a watershed moment for Harvard, as it did not allow Cornell to take its first lead of the game. However, the Big Red would go on to erase the Crimson’s edge anyway. 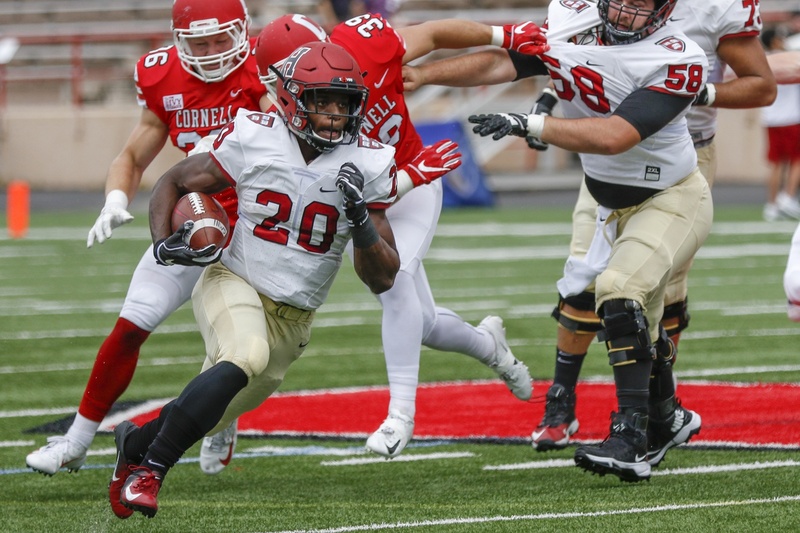 An important factor in Cornell’s second-half resurgence was running back Harold Coles, who tallied 70 yards on 15 attempts in the host’s comeback bid. As a result of the offensive struggles, the contest featured two punters who seemed to take the field nearly every series, especially in the first 30 minutes. By the final whistle, the teams had combined for 17 punts. 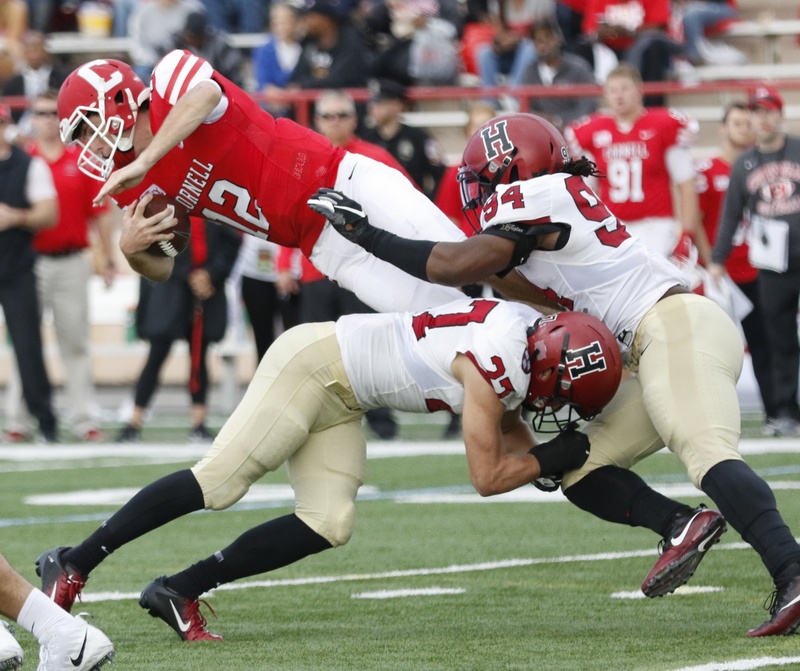 Harvard’s freshman punter Jon Sot racked up 291 yards, while Koby Kiefer of the Big Red went for 333. At one point, the teams traded punts on eight consecutive drives, which spanned from 10:38 in the first quarter to 8:07 in the second. 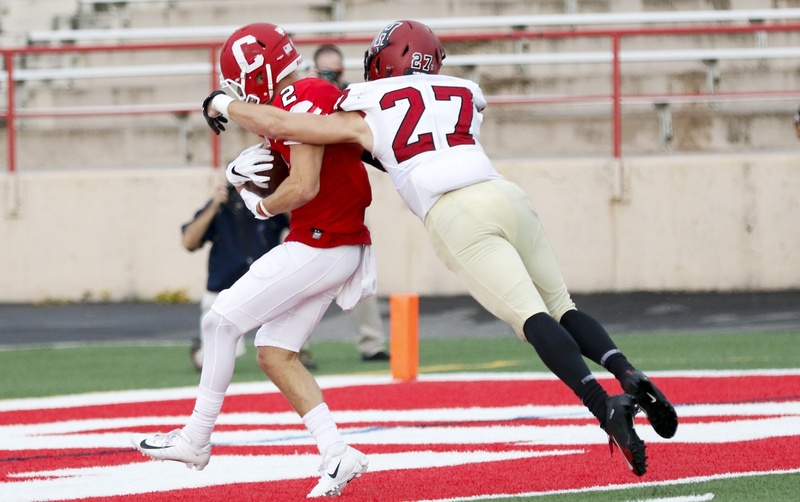 One of the Crimson’s punt attempts allowed Cornell to put seven quick points on the scoreboard to avoid a first-half shutout. With five minutes remaining before the midway point, Sot took the field for the fifth time. Big Red defender Dylan Otolski exploded around the line and got his hands on Sot’s punt. As the ball tumbled back toward the end zone, Justin Bedard entered into the fray and scooped it up, crossing the plane and tying the contest at seven apiece. The Harvard defense quickly forced Cornell to punt, but the return did not end well for the Crimson. As returner Shelton-Mosley was brought down at the 43 by a swarm of defenders, he suffered a leg injury and was removed from the game. Shelton-Mosley remained on the sideline for the rest of the game, walking with the help of crutches. —Staff writer Jack Stockless can be reached at jack.stockless@thecrimson.com. Business as usual. The Crimson starters played well enough to massacre the Big Red, earn another relaxing final quarter, and bore this reporter for the fourth-straight week. Cornell sits deep in upstate New York. For miles there is nothing but trees and hills until there is suddenly a tall concrete parking garage. Atop that garage sits the the Big Red’s windy football field.